Learn how to optimize your cooling water usage. Participants will learn the tools needed to analyze Heat Energy and the Mold Cooling Management required to produce consistent, profitable parts. Participants will learn to systematically challenge the design of new molds and uncover issues with existing molds through a development of best practices for Mold Cooling Management. Class materials are developed by Phil Burger, founder of Burger & Brown Engineering. Learn energy principles in relation to specific polymers. Understand how Heat Transfer and Energy Flow affect part quality and cycle time. Apply formulas to solve heat transfer calculations for different materials of molds and parts. Understand Reynolds Number's relationship to Turbulent Flow. Learn how Energy and Water Conservation can be supported using heat transfer calculations. Study the 3 R's of Scientific Cooling to develop and maintain efficient cooling setup and processes. 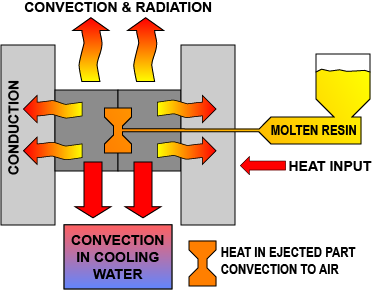 Where does the biggest impact on cooling occur: Part Design, Mold Design or Processing? Discover water chemistry's effect on cooling efficiency and why mold maintenance is so important. Receive an introduction to pump performance curves. Participate in "Hands-On" activities to reinforce learning objectives. Participants are encouraged to bring details of their cooling challenges for group discussion and analysis as time permits. Cooling details such as flow rate, cooling circuit diameter and length may be analyzed in class. Actual parts are welcome along with material specifications, melt temperature, ejection temperature and cycle times. This type of group discussion contributes to a valuable learning experience. After successful class completion with a minimum test score of 70%, you will earn a Scientific Cooling Certificate. You will have the tools to implement Scientific Cooling principles in your molding process. Cost for the class is $1195 for 2 days of in-depth instruction in a small class setting (8 to 12 participants). To Be Determined Contact us to Schedule an On-Site Class. Kevin Turner, Goodfish Ltd. (UK) - "All moulding companies should really use this data as cooling is 70 - 80% of your process." Kevin Clair, Rubbermaid - After participating in the class "I have a better understanding of mold cooling which will help me build better molds." Paul Goldup, Bespak Europe - The class provided a "greater understanding in energy usage. More flow (is) not always needed." Greg Abbott, Plano Molding - Found it very useful to learn "the amount of heat that can transfer through steel and how to calculate the amount of heat water can remove." Read Phil Burger's latest article "An Engineering Approach to Mold-Cooling Circuit Design".